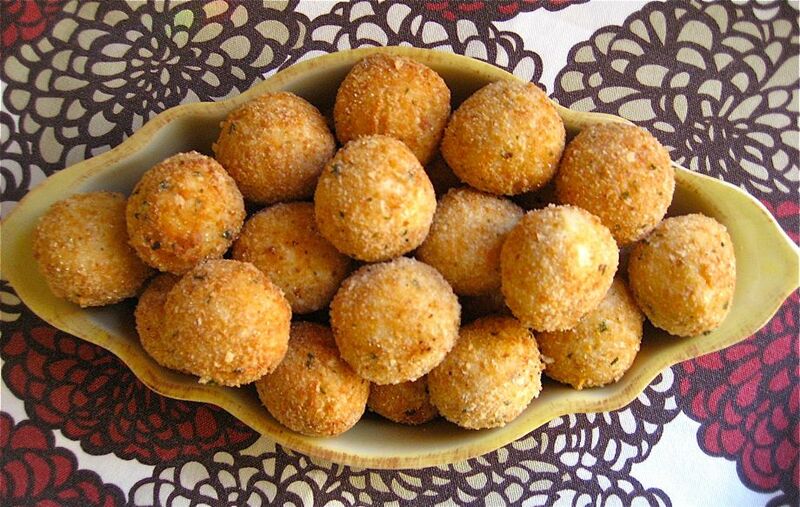 I’m not quite exactly sure what triggered thoughts of delicious, deep-fried, rice balls, but, before I could stop myself, I was headed to the grocery store for a big chunk of gorgonzola cheese and some Arborio rice. The rest, as you can see, is history. I used Giada’s “Fried and Stuffed Rice Balls” recipe, and it did not disappoint. I made some with and without the gorgonzola, and both were incredibly good. These rice balls are different than the traditional ones that my Italian aunt used to make. Hers were stuffed with a mixture of ground beef and peas, and were the size of a softball…totally delicious…but, if you wanted to eat ANYthing else, you cut it in half and shared it. Giada’s recipe instructs you to make the balls about 2″ in diameter…much smaller than the softball, but easier to pop into your mouth like Dunkin’ munchkins. As yummy as Giada’s were, the next time I have a rice-ball-carbohydrate-craving, I think I’ll yield to nostalgia and go with my aunt’s treasured recipe. It calls for par-boiled Carolina rice, simple seasonings, and the ability to mold a 3.8 oz.-diameter ball. Love the prosciutto idea, Aunt Annie! And thanks for the secret to the creaminess (don’t worry…Uncle John will never hear it from me ;-). Missing you, too, and hoping all is well with your beautiful family.